For starters, “forcing” is a misnomer because it sounds too much like work. We’re just tricking the bulbs into thinking winter is over quite a bit sooner than it is. Forcing is an easy sleight of hand that offers the soul-restoring scents and colors of spring at a time of year when spirits sorely need reviving. But you need to plant now, in autumn, to enjoy the results when the snow flies! Although we usually think of forcing Daffodils, Hyacinths, and Tulips, many of the smaller bulbs are also extremely easy and gratifying to force: Crocus, Muscari (Grape Hyacinth), Scilla, Dwarf Irises, and Anemones also will give great results. In a nutshell, here’s what you do . . .
Pot the bulbs in any well-draining potting mix, water them, and set them aside in a cool but not freezing dark spot for the required minimum time (see below), then bring them into warmth and light in the house. The bulbs think spring has arrived and quickly sprout and flower. It’s that easy — the bulbs do most of the work. This is a great project to do with young children, if you want to invite the kids or grandkids to participate. 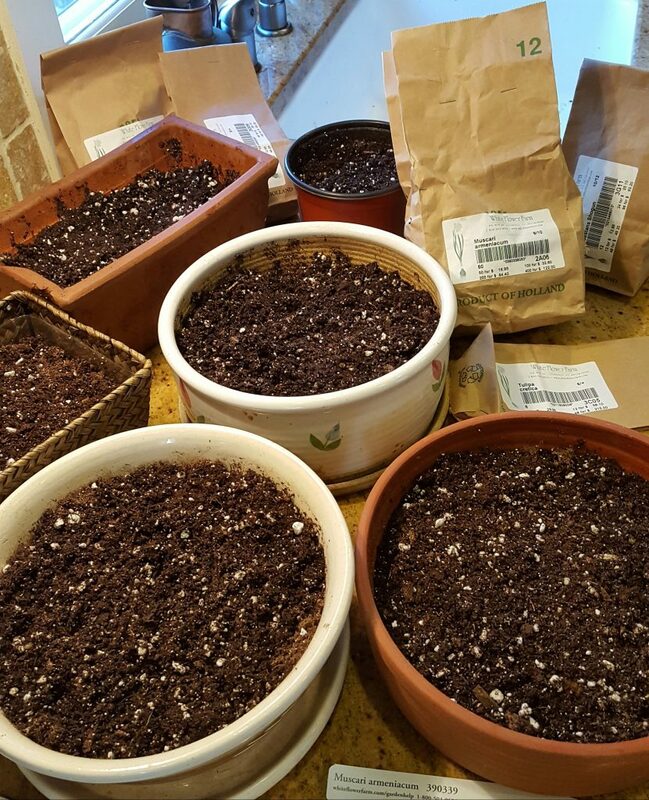 The actual planting is a little messy, so it’s a good idea to spread some newspapers to catch any spilled soil, gather all your pots in one spot, and do all the planting at one time. 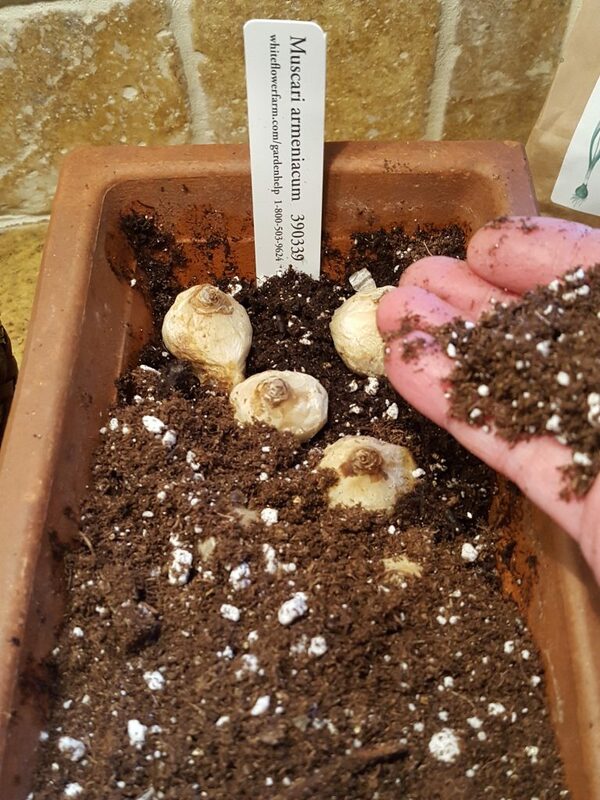 You can use any pot you like to hold bulbs you want to force, as long as it allows room for root growth — about 3-4” of space below the bulbs. This is a great opportunity to showcase flea market finds and tag sale treasures, or your favorite terra cotta pots. If you choose a pot without a drainage hole in the bottom, you’ll have to water your bulbs carefully, because bulbs that sit in soggy potting mix soon will rot. Consider using a ceramic or terra cotta pot if you’re forcing tall Daffodils or Tulips. These flowers can be top-heavy when in full bloom and may topple if grown in lightweight plastic pots. We recommend that you plant bulbs in a soilless potting mix (available at garden centers and hardware stores). A soilless mix holds moisture but allows excess water to drain away readily. 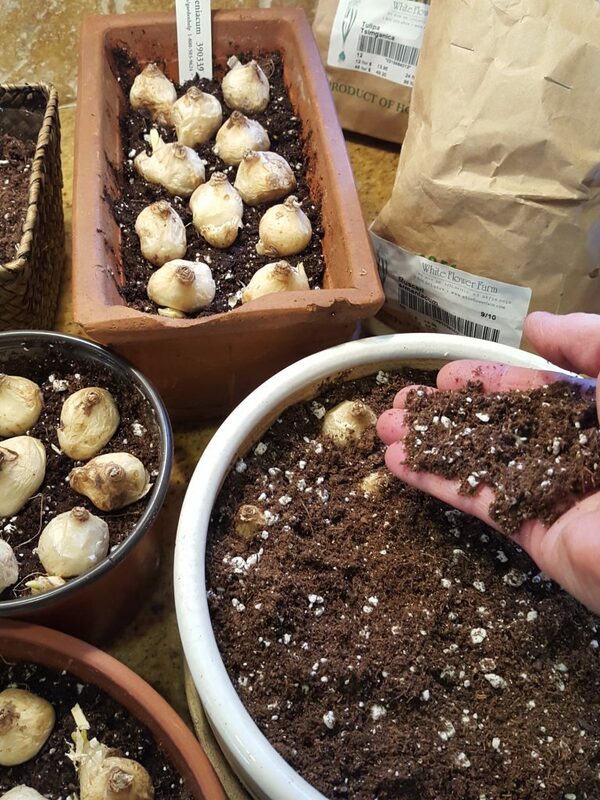 To pot the bulbs, begin by placing potting mix in a plastic tub or bucket. Slowly add water and stir until the mix is moist but not soggy. This is an ideal job for a very young assistant, if you’d like to invite a child or grandchild to join the fun. Add the moistened mix to the container until the pot is about three-quarters full. Set the bulbs root-side down on top of the mix (or on their sides if you can’t tell which end is up, as with Anemone blanda). Space the bulbs much more closely than you would in the garden – they should almost touch. Then add more mix. Cover small bulbs completely with a ½” layer of mix; cover larger bulbs up to their necks, leaving the tips of the bulbs exposed. Water thoroughly after potting. You can keep bulbs cool in a refrigerator, but only if there is no fresh fruit stored inside. The ethylene gas released by fruit during its natural ripening process will interfere with flower development. 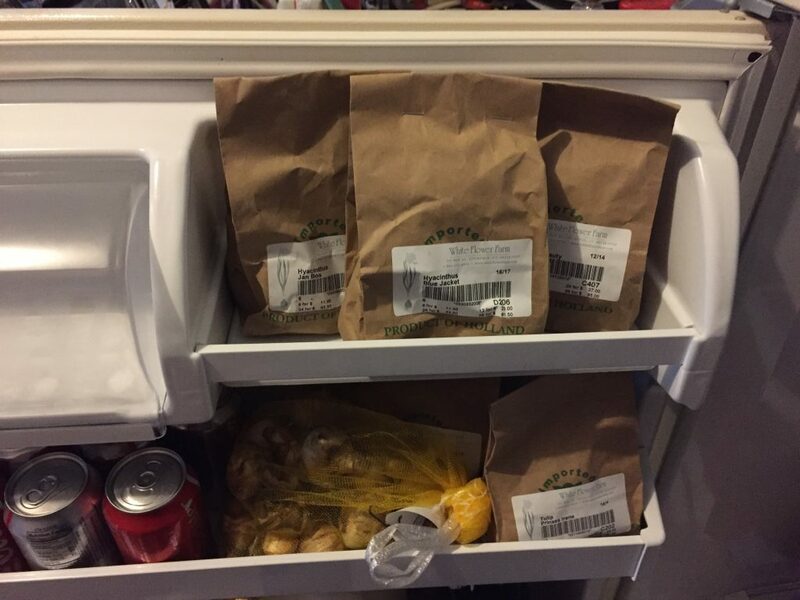 Better to store bulbs in an extra refrigerator, if you happen to have one. To force cold-hardy bulbs into bloom, you must first encourage them to produce new roots by keeping them cool and moist for a period of time that varies by type of bulb (see listing below). The ideal rooting temperature also varies, but most bulbs flower best if stored at 40-60°F for the first 3-4 weeks after potting, then at 32-40° for the balance of the cooling period – a shift that mimics the drop in soil temperature outdoors as fall turns to winter. The easiest way to chill bulbs is to put them outdoors and let nature do the rest. To insulate the bulbs from rapid changes in air temperature and from freezing cold, bury the pots in a pile of dry leaves held in place by a plastic tarp or in a pile of mulch, such as bark or wood chip, and cover the pile to prevent formation of a frozen crust. You also can chill bulbs in a cold frame if you’re lucky enough to have one; a cold basement; or an unheated garage (provided the temperature doesn’t fall below freezing). If you choose to chill bulbs in the refrigerator, be certain there is no fresh fruit stored inside. Fruit releases ethylene gas as a natural part of its natural ripening process, and the ethylene will interfere with flower development. In locations other than a refrigerator, it may be difficult to arrange for the ideal shift in temperature described above. 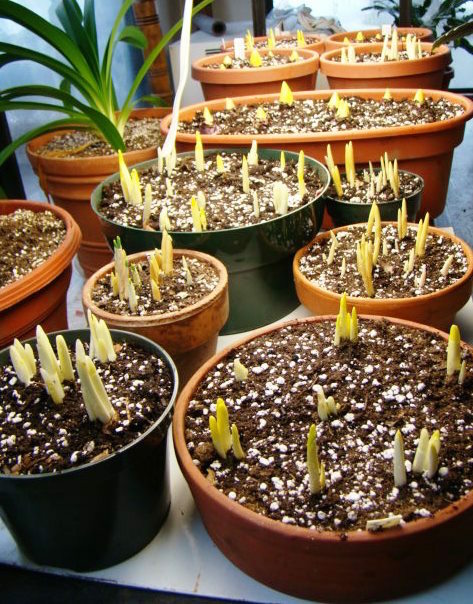 Fortunately, most bulbs haven’t read the manuals, and they will root beautifully if the temperature does not stray too far above or below 40°F during the rooting time. Professional growers fill huge walk-in coolers with potted bulbs and control the temperatures precisely. Using an old refrigerator in a basement can deliver great results without ever touching the temperature controls. The possible downside to outside storage has four little legs. If mice or other rodents have access to your bulbs, they will devour all but the varieties that are poisonous or distasteful to them (such as Narcissus, more commonly known as Daffodils). Protect potted bulbs with steel mesh, such as hardware cloth. Once the bulbs have rooted, you don’t have to bring them out of the cold immediately. Most will tolerate extra chilling time, allowing you to orchestrate a succession of winter bloom. Forced bulbs under grow lights. A sunny window also provides adequate light for bulb forcing. 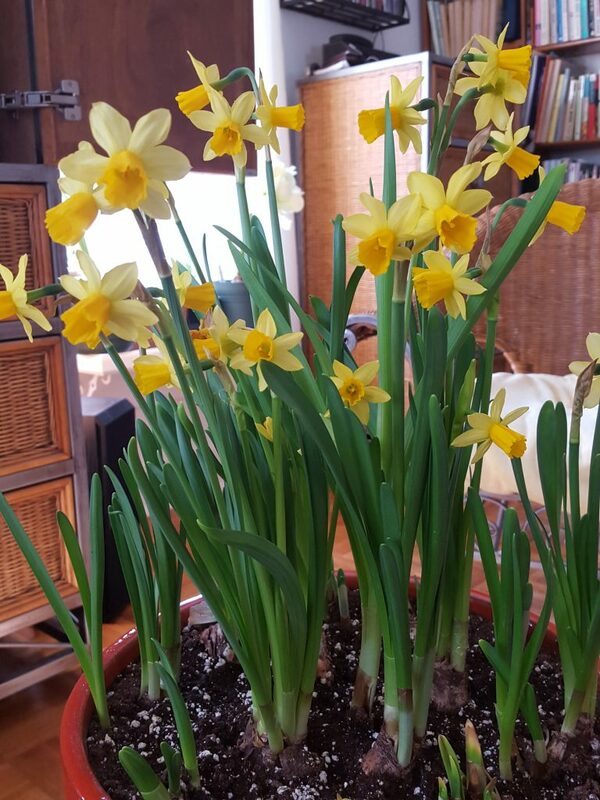 When the bulbs have rooted, bring the pots out of cold storage and set them in a bright window in a cool room (one where the temperature stays below 65°F). Bright light will help keep the leaves and flower stems compact; in weak light, they tend to flop. You’re likely to find that the bulbs have produced white shoots during cold storage. Sunlight quickly turns them green. Keep a close eye on the moisture needs of the bulbs as they send up leaves and flower stems. Initially, the bulbs probably won’t need to be watered more frequently than once a week (if that much), but by the time they bloom, you may need to water them every day or two. Most bulbs will bloom 2-5 weeks after they come out of the cold, heralding spring with their bright colors and sweet fragrances. Duration of bloom varies with the type of bulb and the variety but is generally shorter than you’d expect of bulbs in the garden. Warm temperatures and low humidity indoors speed the decline of the flowers. Shifting the pots out of direct sunlight and moving them to a cool room at night helps prolong bloom. When the blooms fade, we usually recommend that you toss the bulbs on the compost pile. 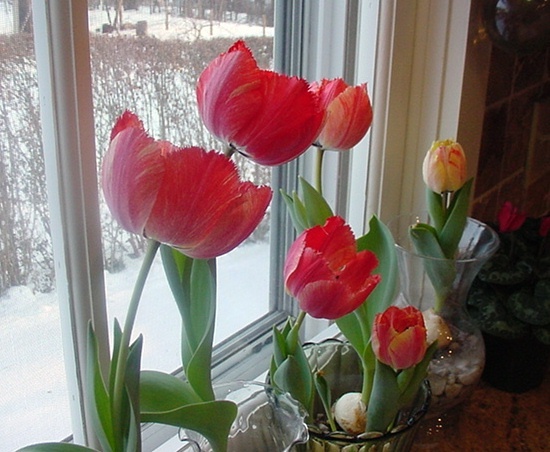 If you keep them in a sunny window and continue to water them, forced bulbs can be planted in the garden after the threat of hard frost has passed, but they won’t bloom well again for at least two years. Tulips rarely bloom again, but Daffodils, Crocus, and Grape Hyacinth are more likely to be worth the effort of planting. The whiskery white roots of some Hyacinth bulbs appeared just 24 hours after they were removed from cooling and were set atop glass gems with water below. Hyacinths can be forced in pebbles and water, or in glass jars. They still require a cool rooting period if forced this way. Special forcing glasses, in use since Victorian days, are shaped like an hourglass and keep the bottom of the bulb dry—only the bulb’s roots reach down into the water. If you are using pebbles in another type of container, place a 2-3” layer of pebbles, such as pea stone, marble chips, or river rocks, in the bottom of the bowl or pot. Set the bulbs on top of the pebbles then fill with more pebbles, leaving the top 1/3 of the bulbs exposed. 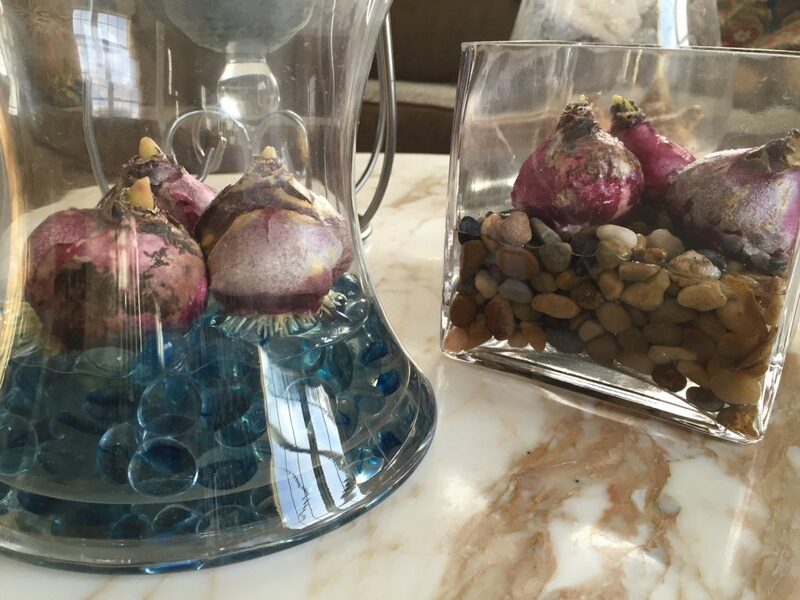 Add enough water to create a reservoir for the roots, but be sure the bases of the bulbs stay above water level. If they sit in water, the bulbs will rot. Then place the container in a dark, cool area (40-50°F) for 4-8 weeks. Check the water level occasionally and add more water as necessary, keeping the water level below the bottom of the bulb. When roots have developed and leaves begin to grow, it’s time to move the bulb into a bright window in a cool room (one where the temperatures stay below 65°F). Bulbs forced in water can be planted in the garden after the threat of hard frost has passed, but they won’t bloom well again for at least two years – if ever. Professionals often recommend very lengthy cold periods, but we’ve had good results at home using the minimums listed here. Remember that bulbs can keep chilling for longer than the minimum. Please note that Tulips do require the longest period to flower successfully.